It's become a deadly autumn tradition in northern India: after the rains of the late summer monsoon subside, farmers set fires to their fields to clear stubble after the harvest and send choking smoke rolling across the countryside. New Delhi, already thick with pollution, can grind to a halt for days. Last year, the chief minister of the Delhi state likened the city to "a gas chamber." While crop burning has been illegal for years, there hasn't been a large enough deterrent to effectively crack down on the practice, in part because it's been difficult to measure exactly how much smoke from the fires is making it downwind to the city. "On certain days during peak fire season, air pollution in Delhi is about 20 times higher than the threshold for safe air as defined by the World Health Organization," said Daniel H. Cusworth, a graduate student at SEAS and first author of the paper. 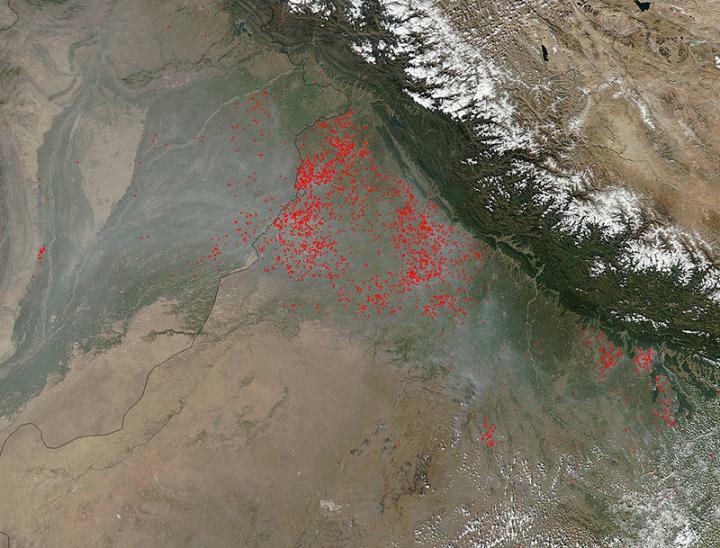 During the post-monsoon season, the air in northern India is particularly stagnant, meaning smoke particles don't vent into the atmosphere as they would during other times of the year. Instead, the black carbon and organic particulate matter slowly permeates throughout the entire region, which is home to 46 million people. In urban areas, that smoke mixes with existing pollution from cars and factories creating a thick, deadly haze. To put that into perspective, the World Health Organization (WHO) puts the threshold for safe air at 25 micrograms per cubic meter, and India's Central Pollution Control Board limits exposure to 60 micrograms per cubic meter, said Cusworth, a member of the Atmospheric Chemistry Modeling Group led by Daniel J. Jacob, the Vasco McCoy Family Professor of Atmospheric Chemistry and Environmental Engineering, and Loretta J. Mickley, Senior Research Fellow at SEAS. "A relationship between pollution and mortality is well known," said Mickley, who co-authored of the paper. "We hope this research can help provide policymakers with a quantitative sense of the consequences of agricultural burning in order to inform decision-making." The paper was co-authored by Melissa P. Sulprizio, Tianjia Liu, Miriam E. Marlier, Ruth S. DeFries, and Sarath K. Guttikunda, and Pawan Gupta.